According to a recent study by Stephane Deo and his collegues at UBS, the euro – as it is currently structured – should not exist. It is hard to disagree. The problem is that it does, and just like the legendary Eagles' song "Hotel California" they refer to, it was intentionally set up in such a way that once you get inside there is no way you can leave. There is no checkout procedure. Which takes us directly to last week’s European Finance Ministers meeting in Poland. 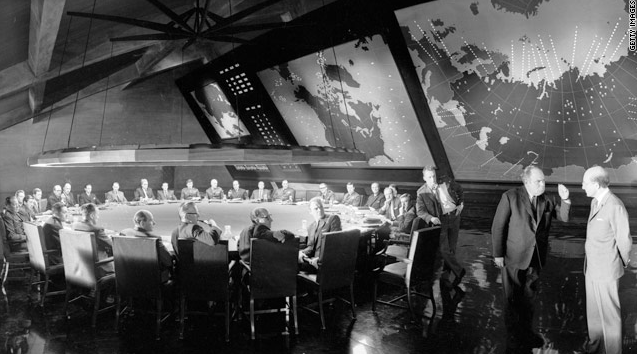 In a setting horribly reminiscent of the Strangelove “War Room,” U.S. Treasury Secretary Timothy Geithner informed the assembled dignitaries that, in a nutshell, Europe was facing catastrophe. The challenge facing the current generation of Eurozone managers is this: The system they created is now malfunctioning and is in danger of exploding under the force of its own internal contradictions. Yet any attempt to dismantle it (by someone leaving, or making someone leave, for example) would appear to threaten all involved with consequences which could easily be far worse, not only for Europe, but for the whole global economy. Hence the dithering, and the reluctance to act decisively. Aside from the odd panic-stricken outburst from one or other EU Commissioner in Brussels, however, it would be hard to discern this harsh reality in any of the recent statements by Europe’s leaders. The euro is a great success, our economic fundamentals are far better than those to be found in the U.S., and we will do absolutely whatever it takes to save the common currency. This is the main message they project to the world, even while doing far less than most external observers consider they need to do, a state of affairs which has led Nobel economist Paul Krugman to speak of “Pharaonic denial." Perhaps the best example of this denial is the insistence of Eurozone managers to focus on only one part of the problem, the fiscal deficit. Only in the Greek case could fiscal excesses prior to the Financial Crisis be considered at the heart of the problem. In Italy and Portugal, the issue is more a combination of low growth and a high level of accumulated debt, an ailment which a decade of euro membership has done little to cure. In Spain and Ireland, the problems facing the economies are more a by-product of massive property bubbles – bubbles whose creation was aided and abetted by a thoroughly inadequate monetary policy administered by the European Central Bank. In all these cases the recent fiscal deficits are but symptoms of a much bigger problem, and at present only the symptoms are being treated. In the meantime even the Zone’s newer Eastern members like Slovenia and Slovakia look to be in danger of catching the disease. Without restoring growth and competitiveness along Europe’s periphery, even the most radical solutions, like a common fiscal treasury and Eurobonds, are doomed to failure. As the population ages and demands on states increase, voters in the North will never accept cuts in their own welfare and pension systems to support economies to the South. But solutions are not being put on the table since the gravity of the issue simply is not grasped. Meanwhile the infernal machine, complete with its initial design fault, continues headlong along its pre-programmed course. Tick-tock, tick-tock goes the clock, but no one really seems to know what time it is. Truer words were never said, even in jest: Europe is facing catastrophe. One of these fine days Greece will default, and the world as we know it will somehow have irrevocably changed. That day we will get to see the future, and will have the opportunity to learn at first hand how the euro Doomsday Machine works. 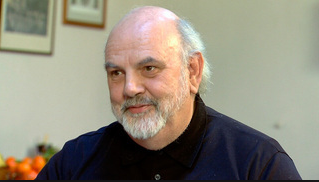 Ireland's Minister for Finance Michael Noonan is an optimistic man. He is also a persistent one. He is optimistic, since he clearly feels that his country's 85 billion euro IMF/EU programme is going to work as planned, and he is persistent as he patently refuses to let sleeping dogs lie. The dogs in question here would be the bondholders of Anglo Irish Bank and Irish Nationwide Building Society senior debt. The heir to these banks owes them some 3.8 billion euros, and the first repayment of 719 million euros of Anglo debt falls due on November 2. In the other corner of the ring, the horse who is in danger of having himself flogged to death by Mr Noonan's persistence is none other than ECB President Jean Claude Trichet, who has been being constantly pestered by journalists since the issue was first raised, and who had difficulty concealing his frustration last week on being asked for the umpteenth time whether he would accede to Mr Noonan's request to procede with some kind of restructuring on the bonds. Just in case his remarks were misinterpreted he did work in a very favourable “When I look at Ireland, I see a country which is gaining credibility regularly,” comment, of course, since Ireland is once more the poster boy for the Eurozone periphery, and he wouldn't want to undo all that good work by taking a clear swipe. As I say, Mr Noonan is a very persistent man, and will hardly take no for an answer, which is why he has not been deterred and is now reportedly seeking a meeting with Mr Trichet to discuss the matter during this week's EU finance ministers meeting in Poland. Of course, you can understand his frustration, since despite all that positive kudos which the monetary union's institutions are able to garner from the performance of their most studios pupil, relatively little is being visibly done in the way of cutting the country some slack in the face of the oncoming deterioration in global economic conditions. And this despite Christine's Lagarde's recent most urgent warnings that no policy stone should be left unturned in the battle to protect vulnerable countries from the oncoming shock, if necessary by the stronger ones making sacrifices. Arguably if any EU country has earned sufficient brownie points to merit protection that country is Ireland. Mr Noonan's insistence on some sort of movement from the EU side is pretty understandable, especially in the light of last week's decision by the IMF (who are not, it would seem, opposed in principle to the bond restructuring request, see below) to reduce the country's GDP growth outlook for this year and next given the stronger headwinds it will be facing. The Fund now expect the Irish economy to grow by 0.4 percent in 2011 and 1.5% percent in 2012, revised down from the earlier 0.6 and 1.9 per cent respectively. What this effectively means is that meeting budget targets will be just that bit harder for the country. So although Mr Noonan tries to put a brave face on it - declaring that next years budget will be only “two thirds” as difficult as this year's - the harsh reality is that austerity measures bite a lot harder as countries enter contraction than they do during an expansionary wave. The austerity measures applied so far have been in the context of a strong global expansion (and hence have been counter cyclical), the ones which are to come will be applied as the external environment becomes more difficult (which is why the IMF have lowered their forecast) and as such they will be pro-cyclical, and will only serve to add additional force to the headwinds blowing straight into Mr Noonan's face. Ireland has done well so far, but I think this relative success needs to be put into some kind of context. In the first place, while GDP may increase 0.4% this year, it fell by 1% last year, 7,5% the year before and 3.5% in 2008. Which means that at the end of Q1 2011 it was still 12% below where it stood at the end of 2007, and is thus still at levels first seen in 2005. At the moment (beyond the positive spin) what we have on our hands are six lost years. More to the the point, the past has left a very problematic legacy: debt. 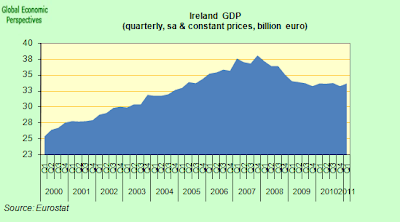 According to IMF data Irish public debt to GDP has risen from 25% in 2007 to an estimated 114% this year. If things go well the IMF now estimate that debt will peak in 2013 at 118%, but as we all know these are very dangerous numbers, and things may not go well. 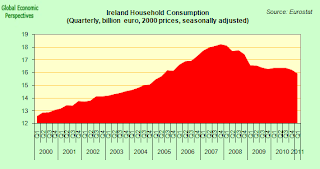 Growth for 2012 has already been revised down from the 1.9% on which the estimate was based, and may well not reach the 2.4% currently forecast for 2013, in particular since the presence of so much household debt may mean the consumption growth projections may not be fulfilled.. So just why may growth not reach these reasonably optimistic levels? 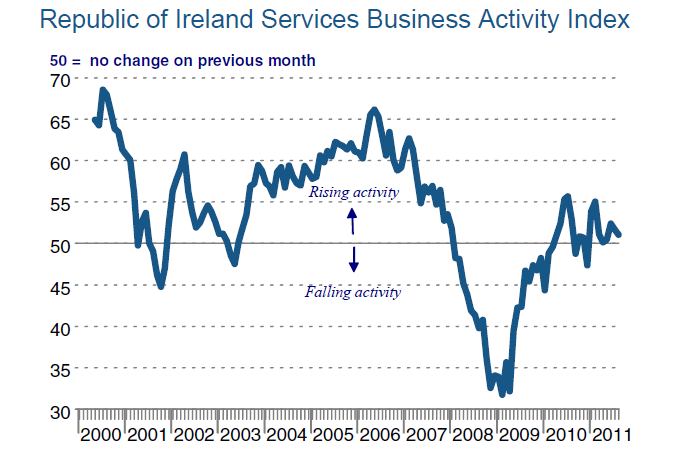 Well one reason could be the external environment, which may not be as propitious to Irish exports as 2010 and the first half of 2011 have been. 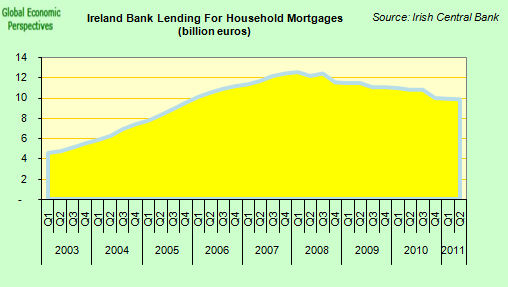 But another reason - as suggested above- would be the overhang of private debt which still weighs down domestic consumption in Ireland. 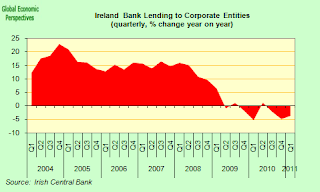 According to data from the Irish Central Bank there were 128.5 billion euros in outstanding loans to the household sector at the end of July, while loans to non financial corporations were around 89.5 billion euros, making a total of 218 billion euros or around 130% of GDP. So public and private debt combined is now not far short of 250% of GDP, which is a lot in anyone's book, and especially in an economy which is barely growing due to various years of competitiveness loss. The result of this substantial debt overhang is that Irish household consumption has contracted sharply, and shows no sign of recovering. Of course, those who have been following closely other debt-strapped economies struggling to throw off the impact of the credit bubble without devaluation (like Spain, or Latvia) should not be too surprised to see the pattern here. 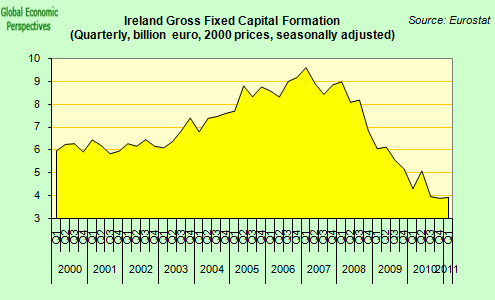 And of course gross fixed capital formation (which was largely driven by property "invesment") has also plummeted. Meanwhile the government is struggling to reduce the deficit, which means of course (in a no-growth/low-growth environment) that government consumption is falling constantly, and will fall even more as deficit targets are complied with in an environment where even nominal GDP hardly moves upwards. I think Mr Noonan has it wrong, this year's fiscal effort is likely to be only two thirds of the one which is demanded in 2012 if targets are to be maintained. So really, it isn't simply that Ireland needs exports to help the economy chug along, in the short run Ireland depends on exports for what little growth it can get, which is why, of course, the recent recession warning from the IMF is so important. And if we come to look at the runes, those indications we have - like the most recent PMI readings - all point towards a serious slowdown/contraction, with no evident end in sight. 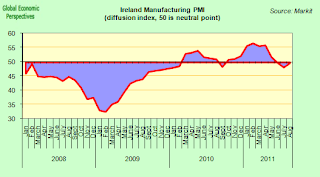 Ireland's August manufacturing PMI revealed that conditions had deteriorated for a third consecutive month, impelled by a substantial drop in new orders, even though among those export orders actually increased slightly, offsetting the domestic trend. Loss of momentum in the services sector also continued in August, even though the survey continued to indicate marginal growth (51.1). Total new business decreased for the fourth month running, and at the sharpest pace in the present sequence according to the report. Again, in contrast to the downward trend for overall new business, new export orders increased, even if the rate of expansion was only marginal. Respondents in particular noted higher new orders from the Middle East, UK and USA. So, even though we still don't know the second quarter GDP numbers but exports were strong, and the trade deficit continued to improve, so growth - such as it is - should remain relatively robust. 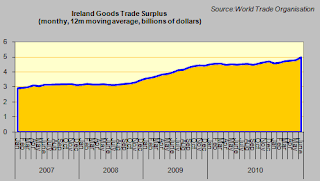 Unlike many of the other economies on the Eurozone periphery, Ireland not been running a massive current account deficit, and has enjoyed an underlying trade surplus. Consequently, the IMF are now forecasting surpluses of 1.75% and 2.5% of GDP in 2011 and 2012 respectively. 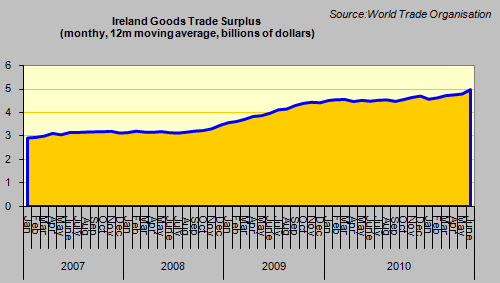 On the other hand, as the IMF also notes, the large role of multinational companies in Irish trade activity means that rising net exports will to some extent be offset by sizeable income outflows, reducing the spillover impact on domestic demand. Which is another reason for being cautious when it comes to predicting positive movements in consumption. 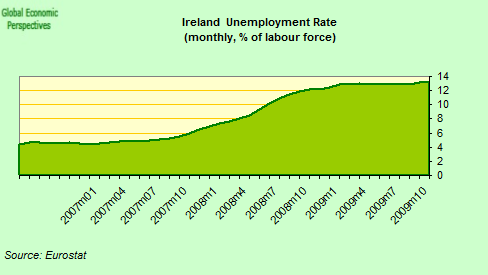 Unemployment - at 14.5% in July - remains high, and has continued to rise, with the natural consequence that bad housing loans also continue to mount. 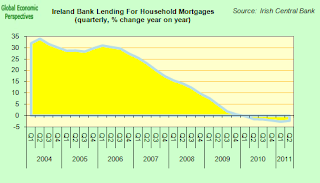 According to the central bank of Ireland, at the end of June there were 7.2% of residential housing mortgages in arrears for more than 90 days, up from 6.3% at the end of March. The rate of mortgage arrears by value rose to 9.4 percent in June, from 8.3 percent in March, with arrears of over 180 days constituting around three-quarters of the total. Residential property prices continue to decline, and in July they fell by an annual 12.5%, bringing the total decline since the 2007 peak to 42.5%. The central bank also estimated that roughly 13 percent of mortgage borrowers are likely to have negative equity, with a much higher share - about one-third among those with mortgages approved from 2004 on. The IMF take the view that negative equity is less important than mortgage repayment to income ratios, given that Irish mortgages are granted on a full recourse basis. In fact this situation has not yet been tested, since relatively few properties have been repossessed (less than 1,000, well, that's understandable in a context were people are being forced to pay taxes to bail out the banks), while more than 60,000 mortgages have been restructured, mostly through rescheduling via interest only loans. Which suggests that the pile of non performing mortgages may be potentially much greater than so far seen, especially if there is a long delay in the economy gaining sufficient momentum to start generating employment. 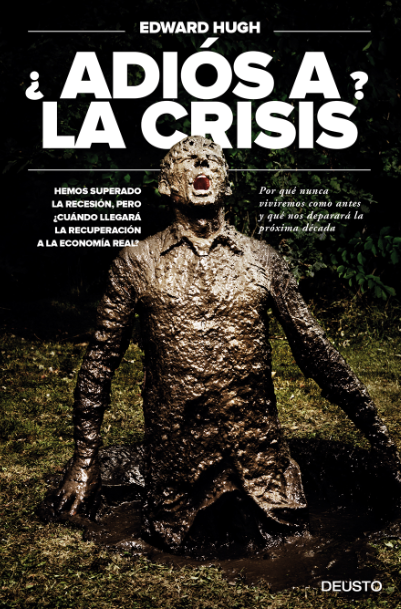 Also, Spanish experience suggests that eventually this "under water" negative equity problem grows with time, and that pressure for changes in the full recourse condition may become unstoppable, especially where the only alternative left to young mortgage holders is family breakup and long term emigration. 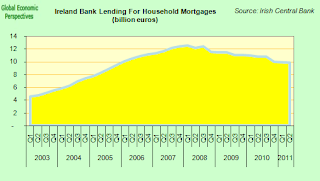 The only real piece of good news in all this is that the ECB may now be about to lower interest rates again, bringing relief to some struggling Irish home-owners, but if unemployment continues to rise under the impact of the global slowdown, then the non-performing mortgages rate will undoubtedly tick up with it. 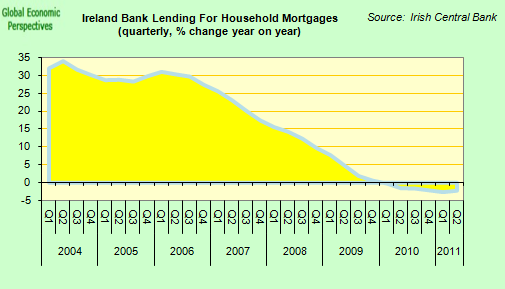 Certainly there can be no doubting the fact that Ireland is still stuck in a pretty violent credit crunch, with loans to households down 3.9% in July (interannually), while mortgages were down 2.4%. Corporate lending also remained tight. So really, and despite all those earnest endeavours, Ireland's debt problem is not in essence that different from the one facing Greece, or the one facing Italy. The country's debt is perched on a knife edge, and its future evolution depends on a small number of key parameters: interest rates, inflation and GDP growth. As the IMF themselves underline, any negative shock to their baseline growth forecast could put Irish debt straight back on an upward path. As they say in illustration, a simple one-third permanent standard deviation shock would lower the average growth rate from 2.5% to 1.25% over the 2011–16 period, and this would see debt spiralling upwards to 132 percent of GDP by 2016. Leaving aside negative events in the external environment (a sharp correction in China in 2013, for example), all that would be needed for this (nearly nightmare) scenario to be fulfilled would be for domestic demand not to recover in the way the IMF are forecasting it will. Unfortunately, and for the reasons advanced above, I think the IMF have got it wrong here. Domestic demand isn't going to recover to the extent anticipated over this time horizon. The second factor which will also influence the future of Irish debt is the inflation rate, since what matters is the growth in nominal (ie not inflation adjusted) GDP. 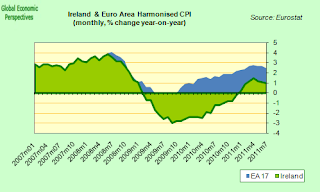 As many observers have noted, what also differentiates Ireland from other troubled parts of the Eurozone periphery is the fact that there has been considerable wage and price moderation (the so called "internal devaluation") since the start of the crisis, and this has resulted in lower than Euro Area average inflation (see chart below). This is above all an indication that Ireland's economy is more flexible that some of the others, but (in the context of a currency union) it also presents a problem, because this moderation is essentially deflationary, and very low levels of inflation (especially when combined with weak growth) can have very negative effects on the debt dynamic, as we have been seeing in Japan. 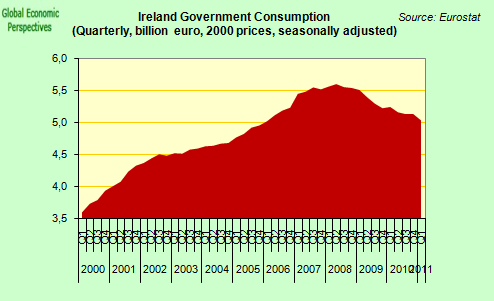 So Ireland, like other Eurozone countries who have lost competitiveness are on the horns of a dilemma. The need to recover strong GDP growth means they need very low levels of inflation to restore competitiveness, while the need to contain the debt means they actually want (some) inflation. In fact the only real answer is to reduce some of that debt by writing it off, and this Mr Noonan well knows, hence his insistence with Mr Trichet. The third factor which is critical to the debt trajectory is the rate of interest charged on the debt. Irish government debt has predominantly fixed interest rates, hence higher market interest rates only affect interest payments on new market borrowing. Were interest rates on new borrowing to remain at current levels the IMF calculate that this would mean a ½ percentage point higher average interest rate on the full debt stock over 2012–16 and a 1½ percentage point higher average interest rate in 2016. In this case, debt would reach 119 percent of GDP in 2014, and remain at 119 percent through 2016. Hence a reduction in sovereign spreads from their current levels is critical to putting Irish debt firmly on a declining path. Fortunately there is some relief in sight on this front following the July 21 European Council announcement regarding the terms of EU financing. While firm details are still lacking official sources suggest that the interest rate on all EU loans may well be reduced by something like 200 basis points with an increase in maturity on future EU loans to 15 years, compared to a current average maturity of 7½ years. As a result, Irish interest rate payments should be reduced by about 3 percent of GDP cumulatively over 2011-16. This means, all other things being equal (which they won't be) that the debt ratio would peak at 117 percent of GDP, and then decline to 112 percent of GDP by 2016. Would that resolving real world dilemmas were as simple as churning out scenarios! One of the main problems facing policy-makers is deciding when on earth it might be possible for the Irish administration to once more gain access to market financing. 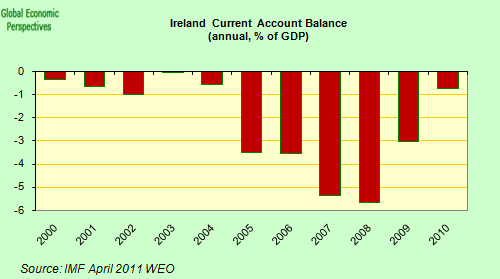 Ireland needs to return in a limited way in 2012, and more substantially in 2013 (or it will need a second bailout just like the Greeks). Evidently recent market developments have been raising doubts about just how feasible the expectation of regaining market access really is, even though the concerns relate to other Eurozone countries (Greece, Italy) rather than to Ireland itself. 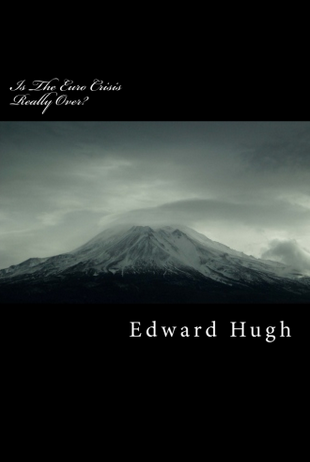 But if the second Greek bailout falls through, and the country defaults, it will be very hard for Ireland not to get caught up in the ensuing contagion, whatever the recent evolution in bond spreads suggests. 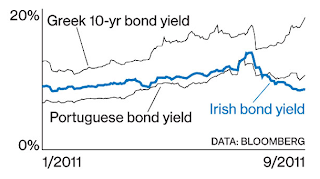 In fact attitudes towards Ireland in sovereign bond markets have improved since the July agreement, in a way which mirrors the improvements in the Spanish situation following the May 2010 decisions. 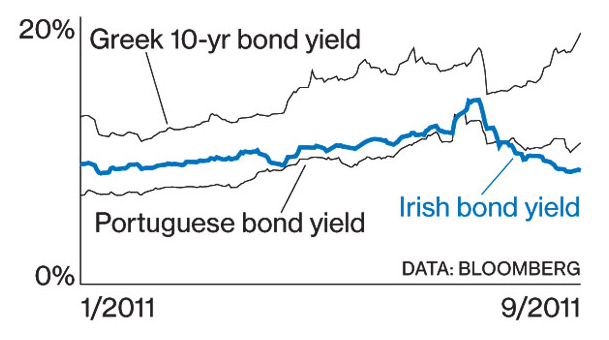 The decline in Irish yield spreads was also reinforced by the ECB’s renewed bond purchases under the Securities Market Programme (SMP) announced in early August. The two-year spread over German bunds fell from about 1,350 basis points to about 900 basis points within a few days. Irish two-year spreads have since declined further and are now below 800 basis points, leading to a good deal of speculation that markets are finally starting to differentiate Ireland from other periphery countries. For reasons outlined above I would say such speculation is rather premature, since there are now far too many downside risks to the Irish situation to simply ignore, even if Ireland's short term prospects are still seen as being rather better than Portugal's. The shape of spreads curves has also changed. Spreads were generally higher for shorter maturities in July, in line with market concerns about shorter-term financing issues. The “spreads curves” have flattened considerably for Ireland and Portugal, reflecting less near-term uncertainty about the future of Irish finances given the July 21 EU agreement on Greek debt restructuring, more favourable financing terms for the bailout loans, and the ECB’s announcement of more bond purchases. One of the big issues identified here is the capacity of the Irish export sector to sustain the sort of growth the country needs to pull down the weight of the debt. This is one of the most misunderstood topics in modern macroeconomics. Even the IMF itself seems to be caught up in the general lack of clarity, since in one moment it suggests that strong export growth will do the trick. "As before, the decline in domestic demand is expected to be outweighed by the positive contribution from net exports.........Continued solid export growth is projected to be sufficient to generate GDP growth of about 2 percent, even as import growth rises somewhat". 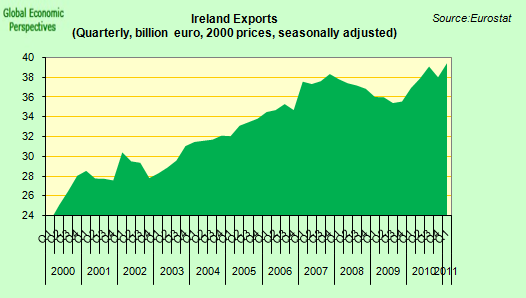 While in the next it suggests that slowing export growth won't be such a big deal, since the import content of Irish exports means the value added component is not that high. 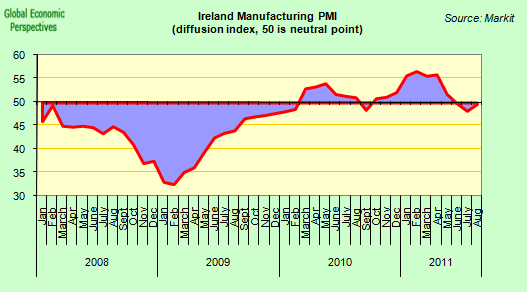 "The services sector PMI indicates falling new export business, and the PMI for manufacturing suggests a slowdown in the growth of new export orders.Staff have therefore lowered projections for growth in demand for Irish exports, especially in 2012, although the impact on activity will be cushioned by the high import-content of Irish exports". So come on now, which is it? On a more general level Ireland also present Europe's leaders with a "having your cake" type challenge, since reading the reports it is hard not to get the impression that Ireland has done almost everything which has been asked of them, and yet the programme still may not be able to work. It is high time politicians in Berlin to started to recognise that fiscal austerity is not the be all and end all of the policy issues they now face. Ireland is applying fiscal austerity, but this alone may well not be enough. A better distribution of the pain needs to be found. As the IMF itself notes in its latest staff report: "there is a strong sense that burden-sharing between taxpayers and creditors for the cost of supporting the banks has been unfair". In recognising the legitimacy of this feeling the IMF stressed with the authorities the need to effectively mitigate the contagion risks such burden sharing would present. Containing contagion when the restructuring inevitably comes will require - as the IMF argue - a robust legal and institutional framework which strikes a reasonable balance between offering creditor safeguards and fairness. This kind of institutional framework will, I imagine, be right at the top of the list of topics Mr Noonan will be looking to talk about when he seeks out Monsieur Trichet during this weeks Econfin meeting in Poland. The Greek tragedy in several acts would appear to be approaching a climactic moment. The warnings coming out of Berlin all week have been hard to ignore: "Greece either puts up or shoves off" would seem to be the blunt message being offered. Only yesterday, German Finance Minsister Wolfgang Schaeuble informed members of the parliamentary budget committee that Greece is now perched on a "knife's edge". This follows hints from other leading German politicians (including Angela Merkel herself) that a Greek euro exit is no longer the unthinkable taboo topic which it had been to date. If Greece does not meet the conditions it agreed to, as assessed by monitors from the International Monetary Fund, European Central Bank and European Commission, then payments will stop, Wolfgang Schäuble told listners to Deutschlandfunk radio during an interview today. “Then Greece has to see how it gets access to financial markets without help from the euro zone,” he said. “That’s Greece’s problem.” Mr. Schäuble did point out, however, that at present there is no legal mechanism to expel a country from the euro area. The fact that an expulsion mechanism doesn't presently exist doesn't mean one couldn't be created, and this was a possibility which the Dutch Prime Minister Mark Rutte explicitly advocated this week in an article in the Financial Times. The backdrop to all this heavy language is, of course, the sudden suspension of the quarterly program review by Troika representatives at the end of last week. The message that is being put across to the Greek administration is that they need to come up with the goods by next Monday when discussions on their review are set to resume—or else. Naturally, the easiest thing to assume is that all of this is simply a bout of strong rhetoric to try and force the Greek government to fall into line. But there is another issue looming which could also threaten to upset the apple cart if the ball bounces the wrong way, and that it the proposed bond swap that constitutes the core of the private sector involvement (PSI) included in Greece's second bailout program at Angela Merkel's insistence. One of the little-discussed features of this swap, which involves some 135 billion euros in Greek debt, is the effect it will have on the legal framework governing Greek bonds. At the present time, some 90 percent of those bonds are governed by Greek law, a state of affairs which would evidently give the Greek authorities a certain advantage were there ever to be a hard default. 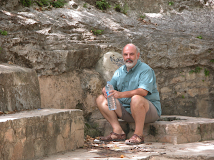 As veteran debt lawyer (and current adviser to the Greek government) Lee Buchheit put it in a 2010 paper on Greek debt restructuring: “No other debtor country in modern history has been in a position significantly to affect outcome of a sovereign debt restructuring by changing some feature of the law by which the vast majority of the instruments are governed.” Given this, it's hard to understand why anyone in such a uniquely favorable position and facing the possibility, nay the probability, of a hard landing would wish to voluntarily surrender it. Yet this is just what will happen if the PSI bond swap goes ahead, since the new bonds will be issued under international and not Greek law. All of this explains why I personally was not that surprised by today's statement from OECD Chief Economist Pier Carlo Padoan that the plan wasn't working out as planned, since there had only been a 75 percent take-up. The Greek government itself raised more than an eyebrow or two when it laid down a minimum 90 percent participation as its condition for proceeding, in a letter the government sent to global finance ministers at the end of August. In theory the deadline for responding was to be tomorrow (9 September) but such is the disorder now reigning in Athens, and even in the headquarters of the National Debt Office, that even this is no longer clear. According to one report early today from Reuters Greece correspondent delays in the Asian roadshow meant the acceptance date would be put back, but then later in the afternoon the same correspondent came out with this story, which clearly suggests that the intention is to maintain the timetable, even though only 70% of bondholders are thought to have responded positively: "September 9 is the cutoff date and it is very likely that we may have a bigger response rate as bond holders rush on the last day," a source close to the procedure is quoted as saying on condition of anonymity. If the PSI falls, then so does the second bailout plan, and judging by the prevailing mood in Northern Europe at the moment, it seems unlikely that all parties are in the frame of mind to go all the way back to the drawing board. So when the Troika inspectors are on their flights back to Athens, it isn't hard to imagine that they will have more than the fiscal slippage implied by Greece's second-quarter 7.3 percent drop in GDP on their minds. The above is an ammended version of a post which originally appeared on the CNBC blog.